The supervisory board of itelligence AG, the world’s leading SAP consultancy firm for medium-sized companies, has appointed Dr Michael Dorin, 39, as the company’s new CFO. The experienced finance expert will be moving to itelligence AG from Stuttgart-based Blue Ocean Entertainment AG, a Burda Group subsidiary, where he has been the responsible CFO since 2013. In this role, he contributed significantly to the publishing house’s considerable growth and internationalisation. On 1 January 2017, Dr Michael Dorin is going to succeed Norbert Rotter, who was appointed chairman of the itelligence AG executive board in July. Dr Michael Dorin studied Banking, Business Management and Economics at Bielefeld University and also completed his PhD there in 2007. 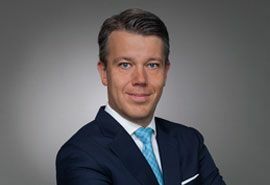 After a stint with KPMG Deutsche Treuhand AG, Dr Dorin joined the Bertelsmann AG Corporate Controlling and Strategy department in 2008, where his most recent position was Director of Corporate Controlling. He started his career with Blue Ocean Entertainment AG in 2011, where he was appointed as the CFO in 2013. Dr Michael Dorin is married and has a son.